Solitary Bees. Common to New York and other places. 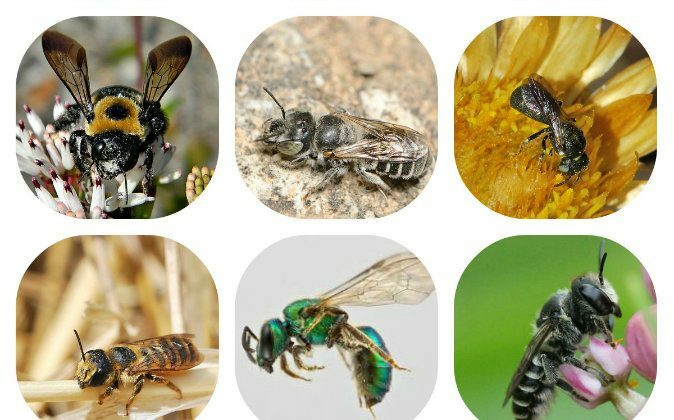 From left to right, top to bottom: Eastern carpenter bee (Xylocopa virginica), Hoplitis (homalocera), Ceratina (dentivrentis), Megachile (albisecta), Pure-green sweat bee, Megachile (rotundata). Would you like to see how a tiny black and white striped bee builds himself a cozy apartment in your garden? Or would you like to see a leafcutter bee at work decorating? There are hundreds of different bee species, many of which live alone (rather than in colonies or groups) and don’t sting. These helpful creatures are currently having a difficult time surviving, with an upsurge in urban expansion and loss of biodiversity. Bees that live in colonies are also in trouble, with colony collapse disorder decimating populations worldwide. While you may not want a whole hive moving to your balcony or garden, maybe you could take in a few of the solitary bees often lacking the basic necessities of shelter and food. Here are some simple instructions for building a modern bee hotel that will do well in any garden—whether its on your apartment balcony or in your spacious country sanctuary. Use the string to bundle bamboo sticks or hollow reeds, and rolled up leaves or cardboard rolls. Paint wooden box or bird house (if desired)—a fun project for kids! Place first bundle in one bottom corner, stacking the other bundles on top of the first one as desired. Continue stacking until the bird house is full enough that all bundles are held in place. Voila! You now have a home for your buzzing pollinators. Drill holes into the wooden block(s) spaced ¾ inches (2 centimeters) apart, making sure not to drill all the way through the wood (the bees will need closed burrows). Drill holes ¼ inch (6 millimeters wide) and 2½–4 inches (6–10 centimeters) deep for leafcutter bees. Masonry bees need their apartments to be 5/16 inches (8 millimeters) wide and 6 inch or 15 centimeters deep. Here are some photos of solitary bees in New York for you to keep with your hotel so can see if their family members come to stay in your hotel. Bees you will find in many places. Some still lack a common name… You might want to give them a name yourself. 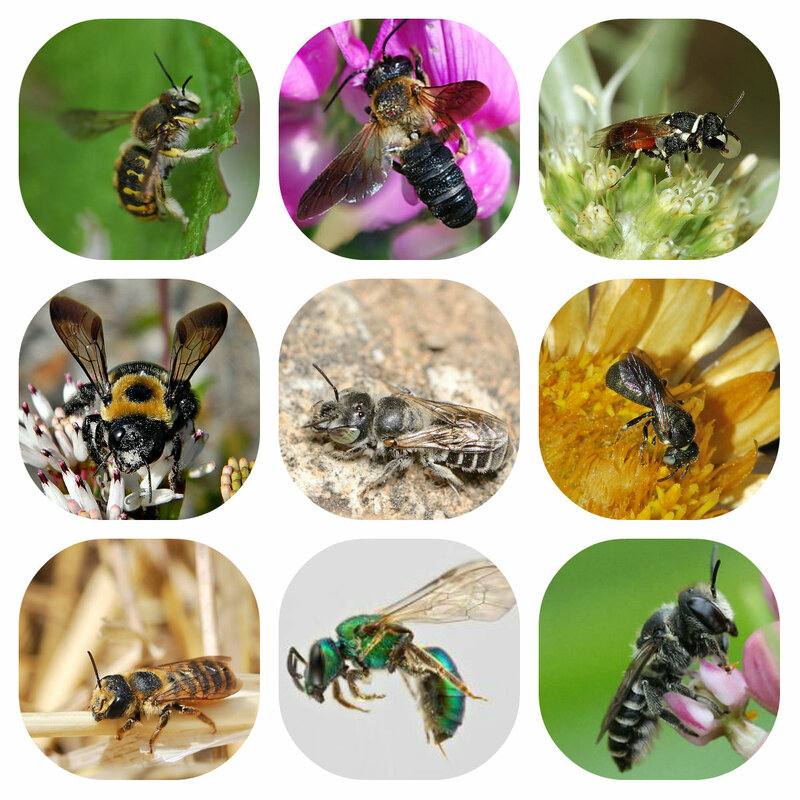 From left to right, top to bottom: wool carder bee, giant Asian resin bee, Hymanoptera (small black and white bees), eastern carpenter bee (Xylocopa virginica), Hoplitis (homalocera), Ceratina (dentivrentis), Megachile (albisecta), pure-green sweat bee, Megachile (rotundata). All pictures through Wikimedia Commons. A new U.K. study has found that caffeine in nectar encourages honeybees to remember the scent and come back for more. Several problems are affecting Canada's bee populations, beekeepers tell senators.